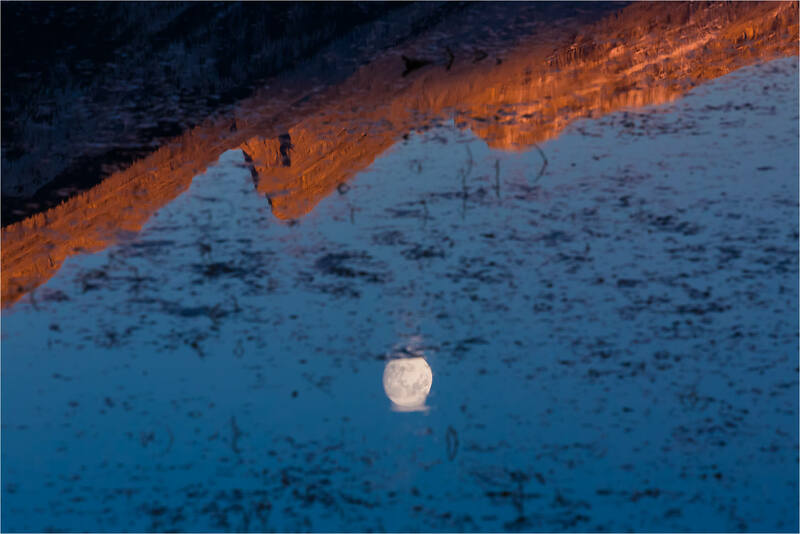 I was happy to miss the moonrise on March 19th. My daughter was performing one of her dance routines – where she sings too so I was in no rush to leave that. Quick shout out to the Moto Café in Bragg Creek – thanks for hosting the recital – wonderful coffee, scones and atmosphere! 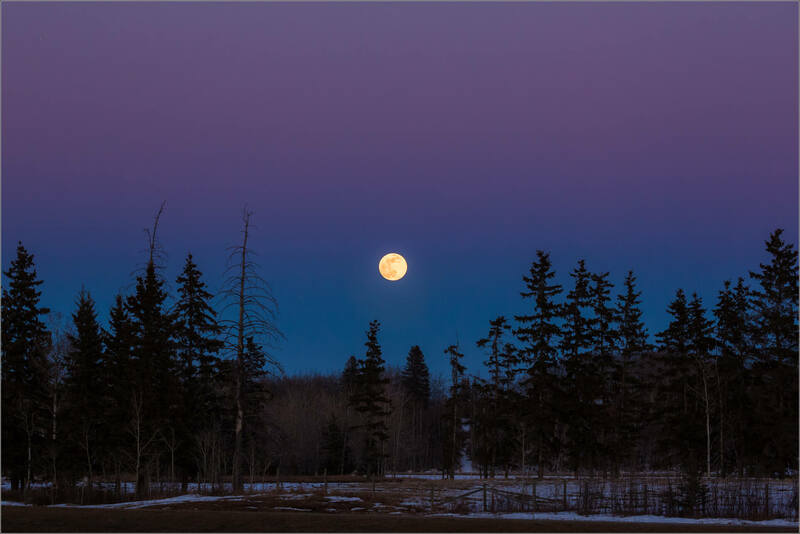 When the performers had all finished, I headed east towards the prairie and found the full moon still fairly low with the alpen glow hanging in the sky above it. 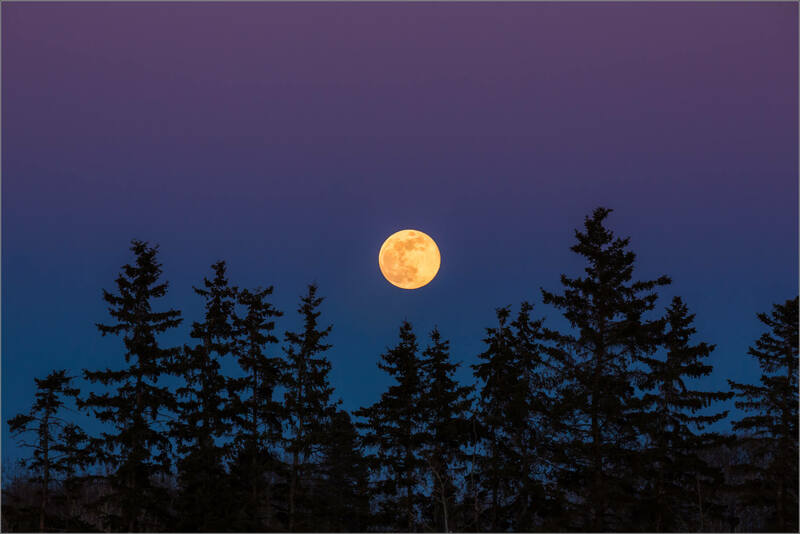 I knew this stand of trees and thought it’s silhouette, along with the color in the sky, would frame the golden supermoon well. It felt like a great start to spring! My son and I returned from a weekend hiking and camping with good friends in the Monashee Provincial Park in British Columbia on Monday night. Wildfires have been a clear and present danger across the province for the whole summer and west of Golden we drove between two separate fires that were burning on mountainsides across the valley from each other. The thick smoke obscured the flames and blocked out much of the sun. It was powerful to directly observe something we have followed all summer remotely. We stopped at a pullout briefly and then continued east towards home. 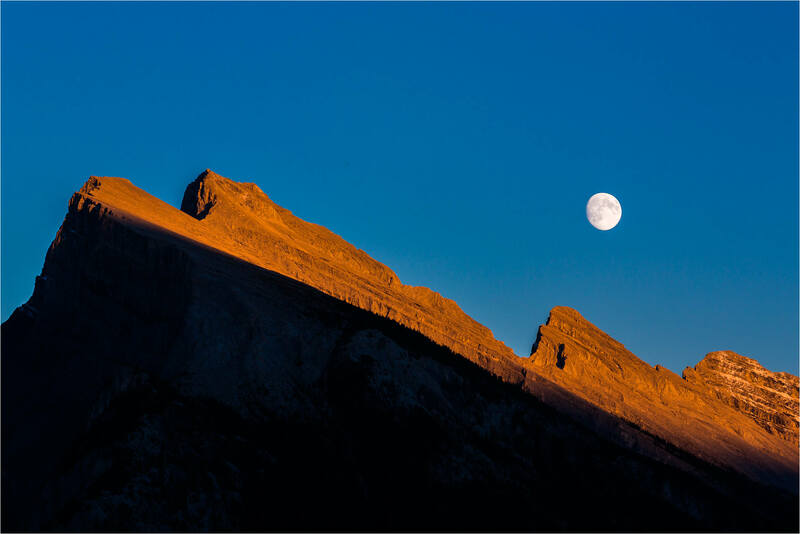 The day retreated and when we were nearing Golden, the moon rose above the forest and mountain ridge lines. The smoke in the air from the fires, and likely others that were not visible to us, turned the sky a purple colour at dusk that moved quickly into a deep blue. 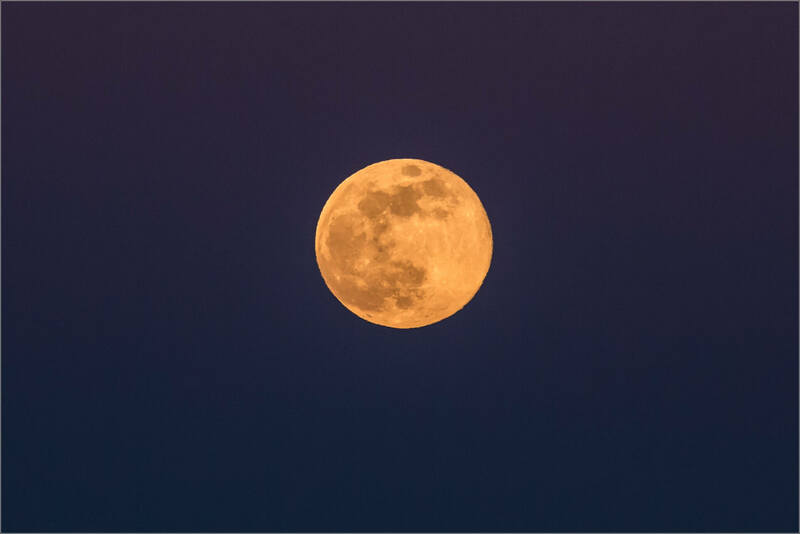 The nearly full moon shone brightly and had an orange cast to it. Beauty from these wildfires that I enjoyed but that I would trade for rain there in a heartbeat. 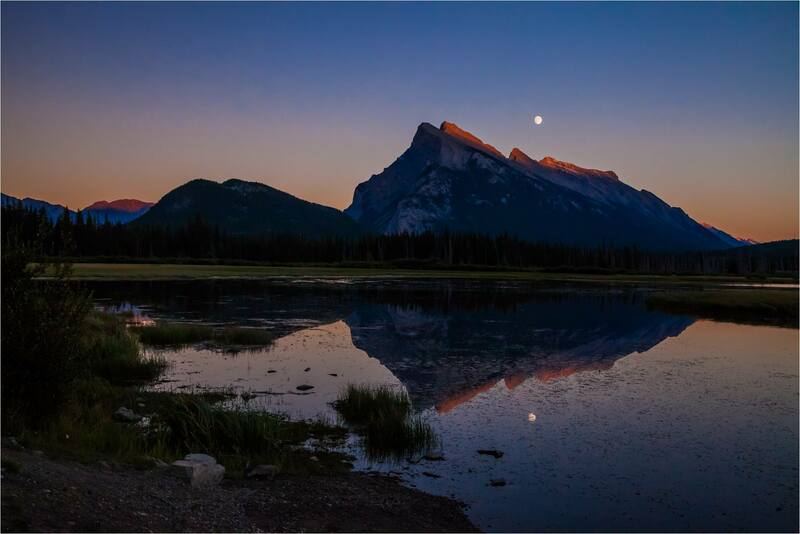 My son and I were in Banff for the weekend and went out for a drive along the Vermilion Lakes just before sunset on Saturday night. 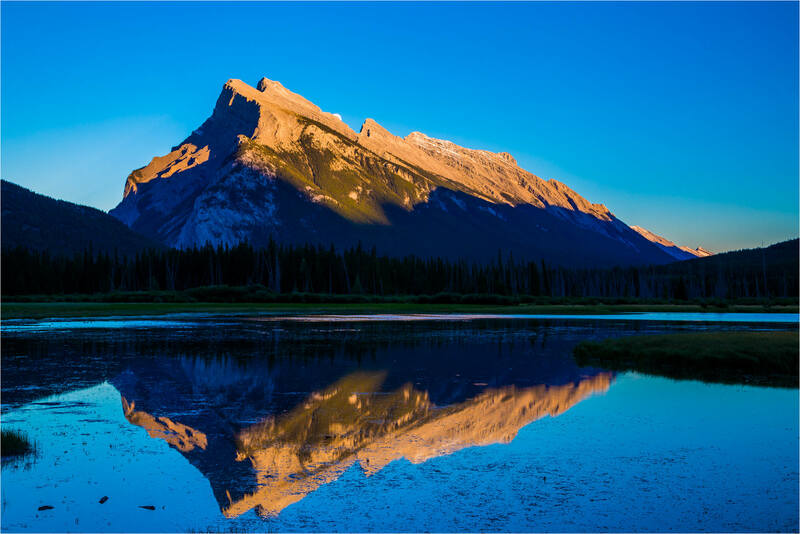 We stopped at the first lake to watch the colors deepen on the face of Mount Rundle as the sun was going down. 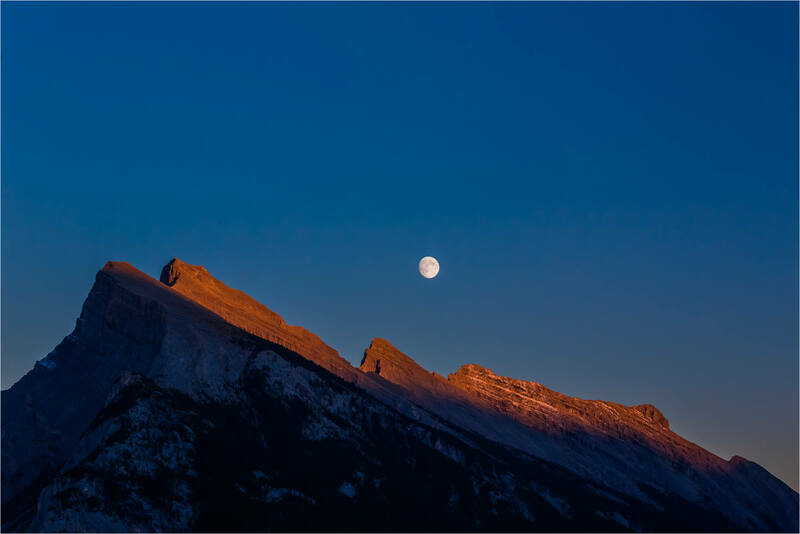 Another photographer, Grace Chen visiting from Calgary, asked me where the moon would be rising. I had to admit that I didn’t know – I hadn’t done any planning as Kian and I were water sliding all afternoon and the drive was a last-minute decision. I was quite surprised when I next looked in the viewfinder and saw a sliver of white rising behind the mountain! It was fun to point at the peak as a response to her question. I had been a bit disappointed that there were no clouds but that proved to be very fortunate. I loved the clean elements of the blue sky, white moon and reddish rocks. The moon climbed quickly, becoming steadily brighter and I finished shooting less than half an hour after first seeing it. 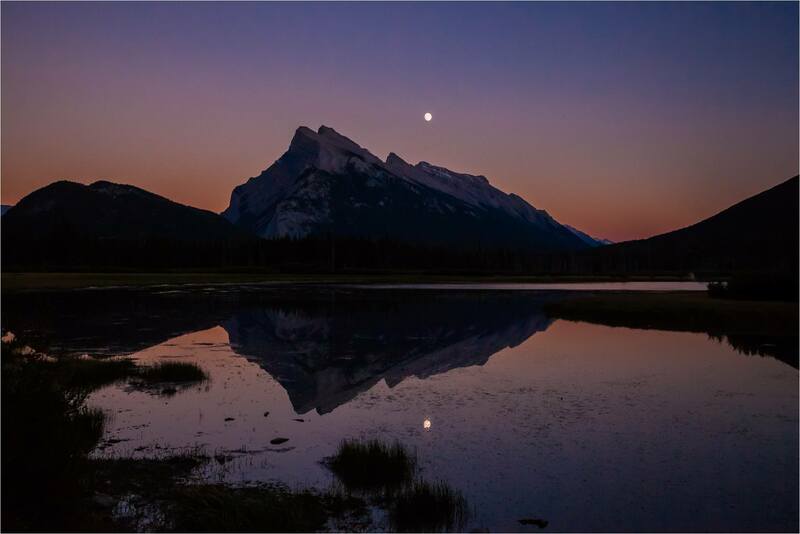 The sunlight on the mountain moved from deep yellow to a beautiful red while the sky steadily darkened. It was not quite a full moon, being at 98%, but was still bright and wonderful. We escaped to Montana for a couple of days yesterday. The drive along the Going-To-The-Sun road that bisects Glacier National Park was beautiful with great views through the mountains in the evening light. When we pulled into Columbia Falls, we noticed a glow along the mountain ridge on the west side of the park. 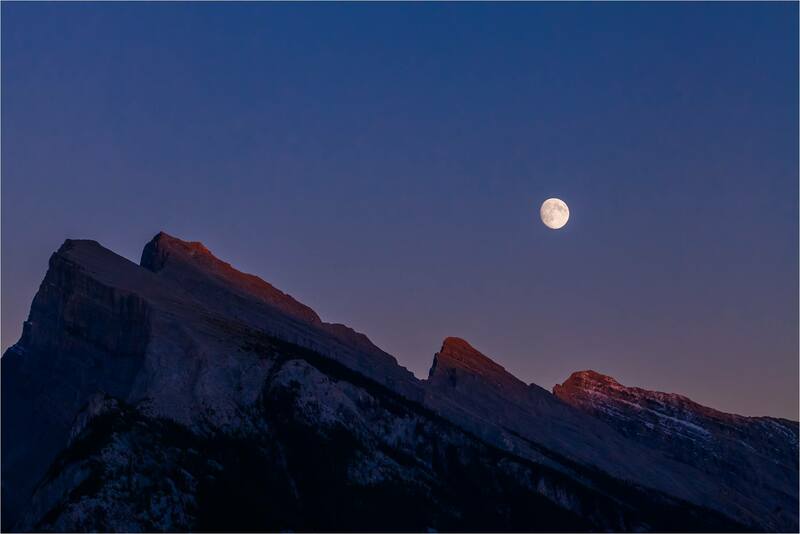 The moon was rising fast and we didn’t have to wait very long to watch it clear the mountains. 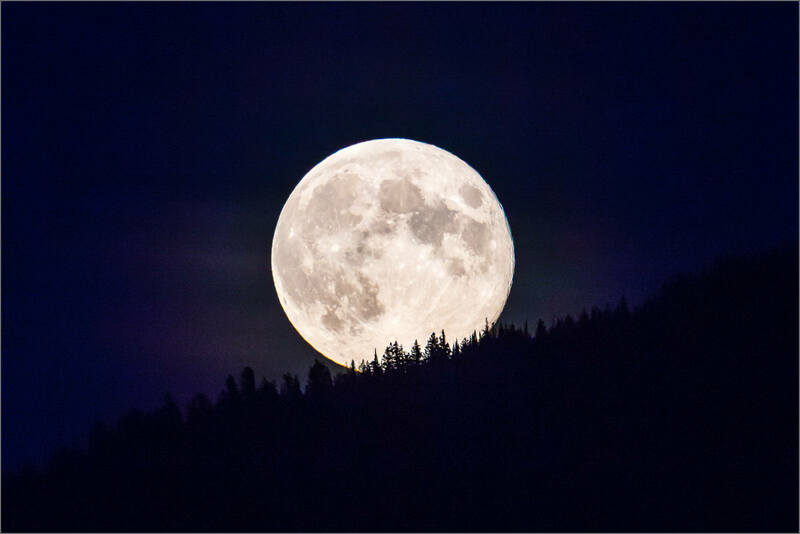 It had a very different feel from the last moonrise I watched in the Khutzeymateen and was every bit as beautiful. A great start to our getaway in another great part of the world.